"Chicken pieces are roasted with veggies and herbs in this easy clean-up method." Preheat oven to 425 degrees F. Line a 13x9x2-inch pan with Reynolds Wrap(R) Heavy Duty Aluminum Foil. Place chicken pieces in pan. Brush with 1 tablespoon olive oil. 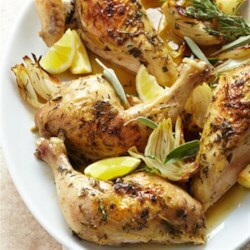 Combine basil, rosemary and garlic salt in medium bowl; sprinkle 1/2 of the herb mixture over the chicken. Add remaining olive oil, potatoes, carrots and onion to bowl with the herb mixture; stir to coat. Arrange vegetables in an even layer around chicken. Cover dish with sheet of foil; fold back one corner of cover for heat circulation. Bake 45 to 50 minutes or until vegetables are done and meat thermometer reads 170 degrees F for white meat and 180 degrees F for dark meat. Carefully remove cover. To line pan, flip pan upside down. Press a sheet of foil around pan. Remove foil. Flip pan upright and drop foil inside. Crimp edges to rim of pan. Fresh herbs can be substituted for dried. Use 1 tablespoon fresh for each teaspoon dried herbs. Before putting a foil-covered dish in the oven, fold back one corner. This allows the heat to circulate and lets everything cook evenly, enhancing those roasted flavors. Here's a video showing this handy kitchen tip. Preheat grill to medium heat. Layer onion, carrots and potatoes on a 12x18-inch sheet of foil. Top with half the herb mixture and two ice cubes. Bring up foil sides. Double fold top and ends to seal packet, leaving room for heat circulation inside; set aside. Tear off a sheet of foil long enough for chicken pieces to fit on. Make several drainage holes in sheet with a large grilling fork. Lightly season chicken with salt and pepper, if desired. Place foil sheet on grill rack; immediately place chicken on foil. Place vegetable packet on grill beside chicken. Grill in covered grill for 35 to 45 minutes, turning chicken every five minutes to prevent sticking, until chicken reaches 180 degrees F for dark meat and 170 degrees F for light meat and vegetables are done. Brush chicken with remaining herb mixture during last 5 minutes of grilling. Technically fine but way too boring for my family. It was visually unappealing but it improved when I removed the foil and cooked for an addl 15 mins. This was excellent.I made per recipe but at the end put under the broiler.It crisped the chicken and the vegetables. Perfect. Made recipe as written and tasted delicious. No changes needed and super easy to make.